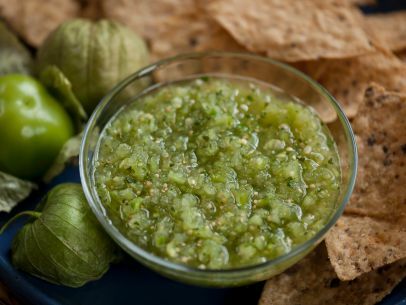 Whether you choose the verdant, slushy, herby freshness of the all-raw tomatillo salsa or the oil-colored, voluptuous, sweet-sour richness of the roasted version, tomatillos are about brightening tang. The buzz of the fresh hot green chile adds thrill, all of which adds up to a condiment most of us simply don’t want to live without. Recipe courtesy Rick Bayless. From Mexico: One plate at a Time; Scribner, 2000.